All of the products shown in this shop are sold directly by Biker-Gifts. By clicking the picture you will be re-directed to their respective website to view the product and hopefully place an order. 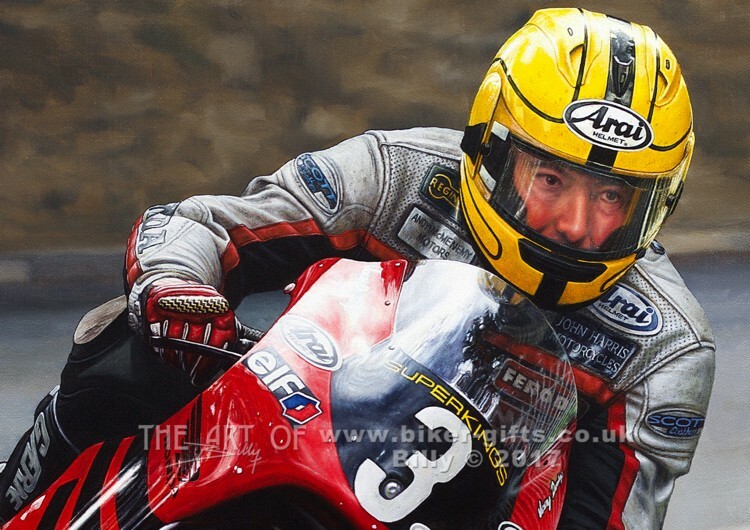 This brand new limited edition Giclée fine art print of the legendary King of the Roads Joey Dunlop - riding in the world famous Isle of Man TT races - is officially endorsed by the late Joey Dunlop's family and they receive a royalty for each print sold. This Limited Edition Fine Art Print of Road Racing Legend 'Yer Maun' Joey Dunlop - The King of the Mountain - Riding the Honda RS125 around Braddan Bridge on the way to his final TT race victory. This brand new limited edition of 850 Giclée fine art prints of the legendary King of the Roads Joey Dunlop - riding in the world famous Isle of Man TT races - is officially endorsed by the late Joey Dunlop's family and they receive a royalty for each print sold. 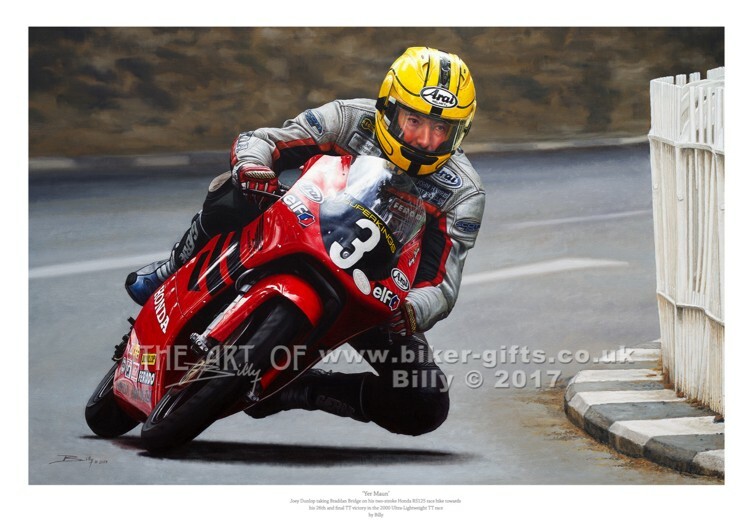 This limited edition print of Joey shows him riding his beloved Honda RS125 two stroke race bike to his record 26th Isle of Man TT victory in the 2000 Ultra-Lightweight TT race, at the age of 48. The print is available in A4, A3 and A2 and is embossed and signed by Billy and come with a certificate of authenticity. Prints 1, 3, 26, 107, 236 and 326 (along with many others) are not available. Each print is embossed, individually signed by the artist and comes with a certificate of authenticity.